It was by no means predestined. He’d looked like a good bet for the majors, after batting .359 for Birmingham in 1948, but quickly learned he wasn’t quite ready for the majors. In 1949, he batted just .146 in early-season action with the Red Sox and was sent to Sacramento for more seasoning. Coming from a cold-weather climate, Dropo was maybe always a bit of a long shot to play major-league ball, but both he and his older brother, Milt, were superb multisport athletes at Plainfield High and the University of Connecticut. Yawkey’s money mattered. Dropo’s father, Savo, hailed from Bosnia and Herzegovina, a Serb who had come to America a year before World War I broke out in Europe in 1914. After establishing himself in the New World, he sent home for a wife. “They got married through pictures,” Walt’s sister Zurka explained. Settled in Moosup, Savo carded cotton in a local textile mill. He and Mary (née Davidovich) moved from company housing to a one-acre family farm with two milk cows, chickens, and a couple of pigs. They raised a few crops – and three sons and two daughters. Vladimir (Walter) was the middle of the three sons, born on January 30, 1923. Walt’s chores including milking the cows, helping with the haying, and chopping wood for heating. The boys played sandlot ball and mother Mary was strongly supportive of her older sons’ athletic abilities; as they became older, she would dig the potatoes so they would have more time for school sports. The mother’s efforts bore fruit; the boys won athletic scholarships to the University of Connecticut, about 30 miles away in Storrs. Serving in World War II, Corporal Dropo saw duty with the Army Corps of Engineers rebuilding bridges in Italy, France, and Germany, and – during the months after the war – building morale by playing ballgames in Europe. Dropo was in Munich when the war ended; he served an additional eight months in Europe playing in morale-maintaining baseball games for Special Services and the USO. Mustered out in January 1946, he returned to the University of Connecticut and resumed high-scoring efforts with the Huskies just a month later. He played more baseball in the spring and football in the fall, taking part in an East-West All-Star basketball game in March 1947 at Madison Square Garden in New York. The following month, he was suspended from further college competition because he’d been found playing a few games in March for Saratoga under the name “Walter Flanagan” in the New York State Professional Basketball League.1 In any event, he said, after he graduated in June, he planned to take up baseball. He reported offers from at least four teams. Late that spring, he played on Sundays for East Douglas on the famed Blackstone Valley League – the same league where Hank Greenberg had honed some of his hitting skills. Immediately after graduation, he signed with the Red Sox, and appeared in 87 games for the Scranton (Pennsylvania) Miners, working under manager Eddie Popowski. He said he struck out his first four times and told Pop, “I’m overmatched” but Popowski replied, “Stay in there. You’re going to play.” Charlie Wagner, another Red Sox lifer, spent a great deal of time pitching batting practice to Dropo, who finished the year batting .297 with 12 homers and 59 RBIs. When the Red Sox’ Billy Goodman suffered a chipped ankle early in 1950, Dropo was summoned from Louisville – and seized the opportunity. On May 2 he tripled to drive in two runs, singled, and walked twice for a perfect day at the plate. The next day he hit a two-run homer, his first major-league home run, off Bob Feller. “As I was rounding the bases, I said to myself, ‘I am a major leaguer. If I can hit his fastball …’” He drove in another run the following inning. The hits and runs and numbers began to mount quickly enough that Dropo was named to the All-Star Game in midseason. And he won the Rookie of the Year Award at season’s end. Dropo struggled in 1951. Billy Goodman was hitting too well to be denied, and Dropo was batting just .251 with 25 RBIs in late June so he was optioned to San Diego. Recalled a month later, he finished the season batting .239 for Boston, with only 11 home runs and 57 RBIs. 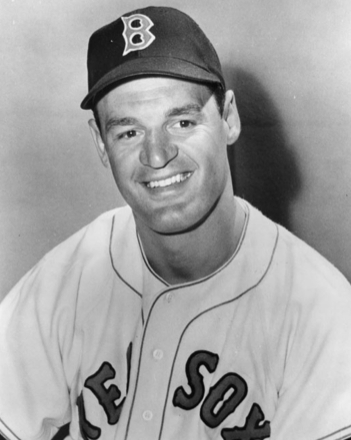 On June 3, 1952, Dropo was part of a nine-player trade that sent him, Johnny Pesky, and three other Red Sox to Detroit for George Kell, Dizzy Trout, Johnny Lipon, and Hoot Evers. Dropo had been hitting .265 with Boston and improved on that with the Tigers, finishing the year with 97 RBIs, 29 homers, and an overall .276 average. He tore up the Red Sox, hitting .411 (30-for-73); seven of the 23 homers he hit for the Tigers came against Red Sox pitching. In July Dropo accomplished something no other player had matched almost 60 years later. On July 14, he was 5-for-5 (all singles) for Detroit in a game at Yankee Stadium. Playing a doubleheader in Washington the following day, Dropo was 4-for-4 in the first game (again all singles), then started off the second game with a triple, a single, and a double his first three times up. He had tied the record of 12 straight hits held by Pinky Higgins. His next time up, Dropo swung at the first pitch and fouled out to the catcher – but then drove in two runs with a single his final time at bat. It was also in 1952 that Dropo met flight attendant Elizabeth Terrill “Terry” Wise on board an American Airlines flight chartered by the Red Sox. He was smitten at once, and pitched in to help her on the airplane that day. Walt and Terry raised three children – Jeff, Carla, and Christina. Dropo’s family background was important to him. As an ethnic Serb, he saw similarities with the struggles of other minorities entering baseball around the same time. He talked frankly to writer Pete Zanardi about his later White Sox teammates Larry Doby and Minnie Minoso and some of the ways in which people tried to discourage him from dining with black players. “A frowning upon the socializing. I told them to pound sand,” he recalled, along with evenings enjoyed when he and Doby saw the likes of Nat King Cole.2 In a famous 1957 incident, Dropo tangled with Enos Slaughter on the field at Chicago’s Comiskey Park. Art Ditmar of the Yankees threw a knockdown pitch at Doby; words were exchanged and Doby slugged Ditmar. Though there was no mention of racial tension in the newspapers, Dropo had heard enough racist bench-jockeying from Slaughter, and wrestled with him, nearly tearing off Slaughter’s shirt. Dropo played all but two of the Tigers’ games in 1953, but his production fell off: .248 batting average, 13 home runs, and 96 RBIs. He played one more year in Detroit, with a .281 batting average butonly about half the at-bats of the previous year, and he was traded after the 1954 season to the White Sox. His average fell three years in a row, though only gradually, from .281 to .256. In 1958, playing only part-time behind Earl Torgeson and hitting only .192, he was put on waivers by Chicago in late June and was claimed by the Cincinnati Reds. The change of league benefited him greatly and he hit .290 for the rest of the season, in the 162 at-bats he got with the Reds. Struggling again in the first half of 1959, serving as backup to Frank Robinson, Dropo had only 39 at-bats and he hit just .103 before the Reds traded him to the Baltimore Orioles on June 23. With the Orioles he hit .278 and contributed some offense but was still relegated to backup work, pinch-hitting, and becoming a role player. It was a difficult adjustment to make, but he made it. “It was easier playing every day,” he said. As Jim Gentile established himself in 1960, it was clear that Dropo’s usefulness was running out. He knew it; he was losing some of his acuity at the plate. Always slow (“I didn’t have the range; I wasn’t quick,” he told an interviewer), he was now a couple of steps slower. At the age of 38, he was released by Baltimore on May 20, 1961. After he completed college, Milt Dropo went into the fireworks business. The business he began became TNT Fireworks and as of 2010 Walt’s son Jeff Dropo was the firm’s vice president. Milton’s reputation in the fireworks industry was such that what became perhaps the most prestigious award in the pyrotechnics industry today was named the Milton Dropo Award. After concluding his baseball career, Walt helped Milt in the business and continued to do so seasonally for many years. He had always been active in ventures that looked to be lucrative. Among them was a unique real-estate partnership, Twin Shore Realty Company, formed by Dom DiMaggio, Johnny Pesky, Eddie Pellagrini, Sam Mele, and Walt Dropo. They sold houses in the Boston area in the middle 1950s, at one point including the former home of Boston politician James Michael Curley. Dropo was one of some 80 professional athletes who owned Chicago realty firm Consolidated Investment Associates. Dropo took up full-time work selling mutual funds, and also served as head of the Heart Fund in Essex County, Massachusetts. He became involved with the Marblehead Little League as well. He later moved to working for Pilgrim Insurance. Younger brother George became vice principal of Plainfield High School and in 1978, the three Dropo brothers funded a baseball scholarship at the University of Connecticut and helped with several alumni dinners. In the 1970s, the brothers took their father on a visit back to his homeland, then part of Yugoslavia. After retiring from investments and insurance, Dropo enjoyed get-togethers with friends and family and continued to be active in a variety of celebrity golf tournaments and other charity events, often for Boston’s Jimmy Fund. He and Elizabeth divorced but without apparent animosity. Daughter Carla said, “It didn't impact us too greatly; they’re very nice to one another.” He suffered a fall off an escalator quite a number of years ago and ultimately required medical attention for a hematoma. After that scare, Dropo remained active attending Red Sox alumni events and local sports card shows, and enjoyed working as an “instructor” at Red Sox fantasy camps for many years, but as baseball became a much bigger enterprise, he chose to keep more to himself. Perhaps his last public appearance was at the tribute to Ted Williams held at Fenway Park shortly after Walt's childhood idol passed away in July 2002. After a very busy life, full of accomplishment, Walt Dropo considered himself, as he put it with true humility, “just an old ballplayer from Connecticut.” He made sure to read the newspaper from cover to cover each day, and preferred a degree of solitude in a safe, comfortable environment with a number of good friends, and with family not far away. We all should be so fortunate. He died on December 17, 2010, at the age of 87. Interviews with Zurka Alfieri, Dr. John Conkling, Carla Dropo, Elizabeth Dropo, Jeff Dropo, and Walt Dropo, between August 30 and September 1, 2007. Walt Dropo interviews were in 1991 and 2002. Thanks to Joanne Alfieri, Ray Birch, Rod Nelson, Ray Nemec, Jim Prime, and Peter Zanardi. 1 The Sporting News, March 24, 1948. 2 Walt Dropo, interview by Pete Zanardi, Society for American Baseball Research.